Google today revealed just what kind of hat it intends to throw in the gaming ring — a cloud streaming service called Stadia. Most of the news was a lot of blue sky development jargon, but it did reveal one thing about Stadia that’ll probably do more to help gamers than any new controller or lack of latency: a dedicated walkthrough button. Most of the reveal was focused on what Stadia could offer game developers — which is natural, as it took place at a game developer’s conference. Supposedly it’ll offer the ability to stream games from anything that runs a Chrome browser or ChromeOS, a heady promise if they can make it work. You can read more about it in my colleague Abhi Ghoshal’s article, but it’s not the platform as a whole that interests me. 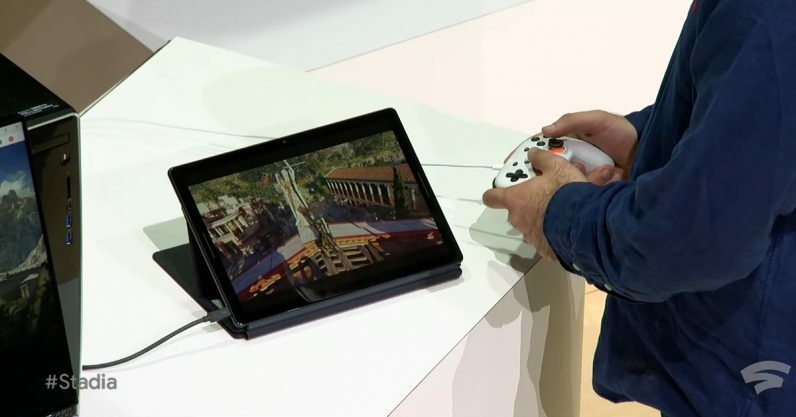 What really caught my attention is the one button on the Stadia controller that summons Google Assistant to help you when you’re stuck in a game. When you hit the button, you can apparently ask for help with that part of the game (they demonstrated by showing a difficult tomb in Rise of the Tomb Raider) In the middle of a reveal replete with promises about the future of gaming, it’s this mundane feature that seems the most useful. Think about it: when you want help with how to beat a particular part of a game, or how to find hidden items or easter eggs, what are you most likely to do? Leave the game — either by picking up your phone or opening a tab on your computer — and searching for an answer on YouTube or in a walkthrough. Nobody really talks about it, but it’s still kind of primitive when you think about it. Grinding your game to a halt so you can scrub through an hour-long YouTube video to find the very particular solution you need? Might as well have a strategy guide open on your knee. It remains to be seen how nuanced it is, but it looks like the one thing in Stadia I’d be using regularly. Google promised that Stadia would be a lot of things — 4K-ready, low-latency, no load times, etc — but all of those things are some variation on what gamers have been promised before. The proof of the pudding is in the eating. Google‘s going to have to do more to sell Stadia to gamers, which it’ll likely do later this year when it reveals more about the platform (including the conspicuously absent price). But being offered your own in-game helper or walkthrough? Yeah, that sounds like it’s more up our alley.